This science-fiction video slot from Net Entertainment provides a 1970’s cartoon design with numerous bonus features to keep you occupied for hours on end. The game is called When Pigs Fly and provides an interesting story that surrounds the first pigs who decided to jump into a rocket ship and blast off into outer space for an epic adventure. 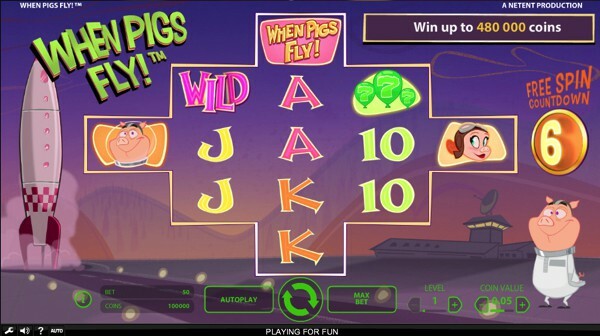 When Pigs Fly is a 5 reel video slot with variable rows featuring 3125 ways to win. The bonus features include wild symbols, free spins, re-spins and a top paying jackpot bonus worth 1,000 times your total bet. The background takes place at NASA where a rocket is about to be launched into outer space with our famous and daring pig pilot located on the right-hand side of the reels, looking very eager to get things underway. The semi-transparent reels are in the shape of a cross when you first start playing but evolves with each winning combination triggered on the reels. There is a total of six themed symbols including the When Pigs Fly logo, a male pig, a female pig, green balloons, a bar icon forming part of a rocket, a winged helmet and the usual 10, J, Q, K and A from a deck of playing cards. When Pigs Fly has a brilliant selection of betting options that will suit your playing style perfectly, regardless if you a beginner or a slot expert. The minimum bet you will be able to place on this video slot is £0.50, while the maximum bet for the high rollers is £100.00 per spin. The big pink and purple ‘Wild’ icon represents the wild symbol and only makes an appearance on reels two, three and four. The wild symbol will stand in for all other symbols to create even bigger winning opportunities. The Re-spin feature occurs in the base game with a countdown meter located on the right-hand side of the reels. With every winning combination, the countdown meter will decrease from six. In addition, each winning combination will also gradually increase the size of the reels. Should you manage to hit six successive winning combinations, you will instantly activate the free spin feature. Once the free spin feature is activated, you will be awarded 8 free spins with a full reel set to enjoy your free spins on. That means you will have a total of 3125 ways to win available during this feature. Unfortunately, you will not be able to re-trigger the free spin feature. When Pigs Fly was released in 2016 and provides a medium volatility level to provide regular payouts that contain a decent cash prize with every winning combination triggered on the reels. The quirky cross-shaped grid makes this a rather unique and entertaining game with more pay lines than any other slot game currently on the market. This technicolor video slot also provides relevant sound effects, fine graphics and a mind-blowing theme that cannot be missed. When Pigs Fly is a popular slot from Net Entertainment. We have embedded a demo version of the game below that you can try for free before you decide if you want to play the slot with real money. The game can be found at casinos like Dunder Casino, Spinit Casino and LeoVegas Casino.